Before Christmas, Teena was in Winnipeg and came home with some local beer plus one from BC, which we cannot get in Ontario. This was one from Tree Brewing in Kelowna and I love the name, Thirsty Beaver Amber Ale. 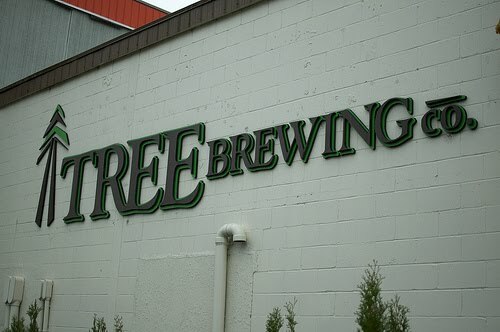 Tree brewing was opened in 1996, and according to the BC Beer Guide "After a series of ownership/management/image changes over the years, Tree seems to have settled into the 'beer with character' theme that appears to be quite successful. Through all the changes, the beers have remained solid and the line-up includes some of the more distinctive beers in BC. The brewery was started in spring of '96, using Shaftebury's original brewing equi pment, which was no longer needed due to Shaftebury's move to larger premises. It originally billed itself as a lager house, with the intention of standing out in a sea of craft-brewed ales. They soon came to realize, as Okanagan Spring did 10 years earlier, that "ale" is the magic word for B.C. beer enthusiasts." Note: Shaftbury brewing moved to a bigger location and was then bought out by Sleeman. The brewery has an excellent reputation among the Beer Geeks on the Bar Towel, and Thirsty Beaver is their most popular ale. I'm looking forward to finally having a taste. The beer pours dark amber in colour with a nice head. As the head dissipates, I see nice lacings lining the side o f my glass. There is a sweet maltiness to the aroma. The beer is a sweeter beer than I expected. A very slight hoppiness is present if you leave it in your mouth and swirl it. This is a nice beer, which would make a good session ale. It's not one I would go out of my way for, but definitely would have some if I found it on tap. It also is good enough that I would also like to try some other Tree Brewery beers.